Runner’s lunge is Arda Mandalasana in Sanskrit. It is not just for runners as the name suggests however it is a pose that I like to do after a track workout because of the deep stretch it provides in the hip flexors. The hip flexors drive your leg forward and if they’re too tight, they’ll limit your extension thereby shortening your running gait. Tight hip flexors can also cause muscular imbalances and warp your posture. Getting into the pose: There are different ways to get into runner’s lunge. Extending the leg back from standing forward fold or bringing the leg forward from downward dog are options. In this case, transitioning from standing forward fold, step the right leg back as your hands frame the front foot. Press into the ball of the right foot while extending the heel back and down to lengthen the calf muscles. Alignment cues with right leg back: Keep left knee stacked over left ankle. Right leg is straight with muscles engaged and hips level. Spine is long and gaze is forward creating one line of energy from the crown of the head to the right heel. Engage the core muscles and use your hands to stabilize the pose and gently guide the sternum forward. BREATHE. I had the opportunity to teach yoga at a Wellness Fair hosted at my high school yesterday. It’s so great that the school promotes health and wellness to its students and faculty. Building awareness and creating healthy habits at a young age is so important. I was grateful to share my practice with the students and teachers and was surprised at how smoothly things went in a room full of coed teenagers unfamiliar with yoga. I was fortunate to grow up with healthy role models. In the 80’s, my parents joined the gym and worked out regularly on Nautilus equipment. I would accompany them frequently and test my strength on the machines. I always wonder if lifting at a young age had anything to do with being the runt in the family…but whatever. What’s important is that exercising and eating a balanced diet of unprocessed foods was the norm in my family and these healthy habits that are so foreign to many come so naturally to me. I hope that schools continue to host wellness fairs of this kind offering various pathways to healthy and happy life-styles. Everyone deserves to be joyful, healthy, peaceful and at ease. Bound extended side angle pose or Baddha Utthita Parsvakonasana in Sanskrit is a variation on extended side angle. By binding the hands behind the front leg, this variation allows a greater opening of the shoulders and chest, lengthening of the spine and strengthening of the leg muscles while challenging your balance. Getting into the pose: Transition from extended side angle (feet are positioned 4 feet apart. Back toes are pointed in at a 45 degree angle while front foot is facing forward. Right knee is bent at a 90 degree angle with knee cap aligned over heel. Right hand is on the inside of your right foot and left arm extends overhead with fingertips reaching forward). Weave your right arm under your front thigh and bend your left arm behind your back to clasp the opposing wrist. Alignment cues with right leg bent: Keep knee in alignment with ankle and moving in the direction of the right pinky toe. Keeping the spine long, rotate the chest up as you roll the top shoulder back so that it stacks over your front thigh. Draw belly towards spine engaging the abdomen. Gaze up to support the spinal twist and opening of the chest and shoulders. Keep the collarbones wide and maintain a strong base in the legs. BREATHE. As a child growing up with a backyard surrounded by miles of untouched woods and beaches within walking distance, playing outdoors in nature was as natural to me as breathing. During the school year I could be found playing in the woods from the moment the school bus dropped me off up until dinner time. During the summers, my days were filled swimming in the sea, searching crevices for blue crabs and building sand castles. To this day I make an effort to spend time in nature for its ability to bring me balance, peace and relief from the stresses of modern day life. Read more about how time in nature benefits you and easy ways to access this cure-all. Viparita Virabhadrasana, otherwise known as reverse warrior, commonly follows Warrior II in a vinyasa yoga sequence. To me this is a very pretty pose. One of my favorite cues for reaching the front arm overhead and back is to reach the finger tips forward, flip your hand and paint the ceiling with your palm. The imagery of painting the ceiling with your palm is quite graceful, fluid and pleasing to me. I’ve only heard one teacher use that cue which I occasionally borrow when instructing students – thanks for that! Since starting the pose of the week series, I’ve noticed that my favorite poses tend to have a side bend component and warrior stance to them which is the case with Reverse Warrior. I hope you like it as much as I do! Getting into the pose: Feet are positioned 4 feet apart. Back toes are pointed in at a 45 degree angle while front toes are facing forward. Heel of back foot is in line with heel of front foot. Front arm extends overhead and fingertips reach back with palm facing down to get a stretch in the side body. Front knee is bent and front thigh is parallel to the mat. Back let is straight and back arm is resting on the calf. Alignment cues with right knee bent: Continue to bend your right knee as you reach your right arm and fingertips over your ear and back getting a deep stretch in the right side body. Gaze up at your fingertips and slide your left hand down your calf being mindful to avoid the knee joint. Left leg is strong as you pull up on the knee cap. Press weight into the outer edge of your left foot. Avoid collapsing in your left side body and create space between your left shoulder and left ear. Breathe into the side stretch. • Strengthens and stretches the legs, groins, hips, and the sides of the torso and waist. • Improves flexibility in the spine, inner thighs, ankles, and chest. • Increases blood flow throughout the body, reducing fatigue and helping to calm the mind. Track Workouts. Reaching Your Yoga Edge. My approach to fitness is well-rounded. I swim, bike and run as part of my triathlon training regimen and practice yoga to increase flexibility, build strength, calm my nervous system and connect within. One of my most important and effective weekly workouts takes place on the track. Read more about how track workouts can quickly boost your fitness level, burn fat and build muscle. And always balance these intense workouts with a calming yoga sequence. Utthita Parsvakonasana (try saying that in yoga class!) also known as extended side angle. This is another one of my favorite poses for the glorious stretch you get from the heel of your back leg to your front fingertips. As the entire side body lengthens, I like to think I’m adding at least an inch of height to my frame. It’s good to dream! Getting into the pose: Feet are positioned 4 feet apart. Back toes are pointed in at a 45 degree angle while front foot is facing forward. Extend arms out to the side parallel with the mat, bend right knee at a 90 degree angle (knee cap aligned over heel) and place right hand on the inside of your right foot as you extend your left arm over your head with fingertips reaching towards the front of the room. Alignment cues with right leg bent: Back leg is strong, press back heel down as you reach through the front fingertips. Left hip is slightly forward and upper torso rotates back to the left to open up the chest. Left arm reaches back over left ear with palm facing down. Gaze at left fingertips and avoid sinking weight into the right hand. Use the right arm as leverage to align the right knee with ankle. BREATHE. My love of butter coffee is strong. 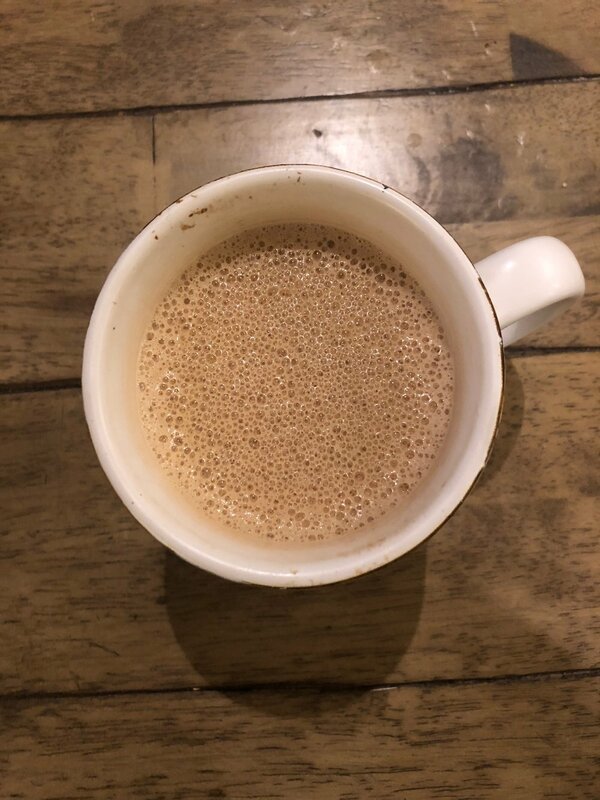 I start each morning with a cup of butter coffee (sometimes referred to as bulletproof or keto coffee). Its ingredients provide an immediate energy boost, stimulate my metabolism, optimize brain function and keep me satiated until early afternoon. The three ingredients in butter coffee are grass-fed butter (substitute ghee if dairy-free), MCT oil and coffee. The ROI in terms of health benefits of each is pretty outstanding. Grass-fed Butter: Rich in omega-3s, CLA, beta-carotene, antioxidants, and vitamins A, K, D & E.
MCT Oil: Medium-chain triglycerides increase cognitive function and energy and boost the metabolism. Coffee: A great source of antioxidants and essential nutrients. 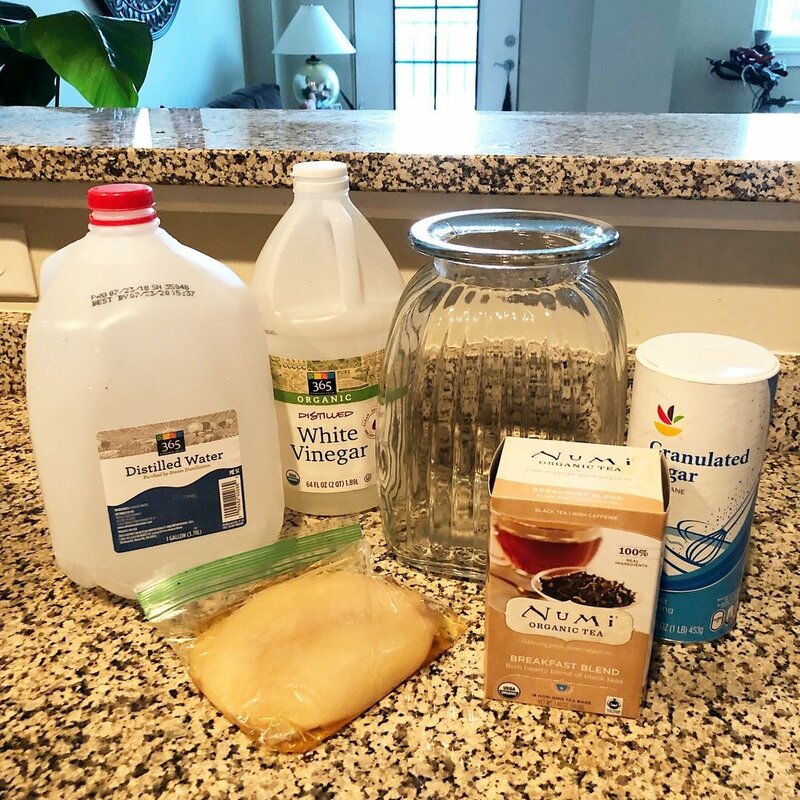 After brewing your coffee, pour the single serving into a high speed blender (I use the ninja bullet) and add 1 tablespoon of grass-fed butter and 1 tablespoon of MCT oil. Blend to a creamy consistency, pour the finished product into your favorite mug and enjoy! Brace yourself for more energy, improved brain function and optimal digestion. Sometimes all you need is a little patience. And a beautiful view. Trikonasana, also known as triangle pose, is my all time favorite standing asana (A Sanskrit word for a yoga posture, if you want to get all fancy). 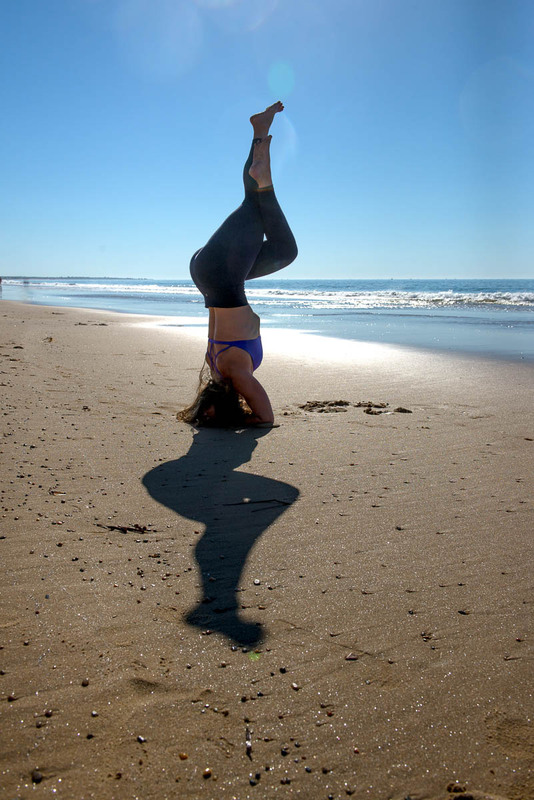 Casually weave the word trikonasana into a group conversation at a party and see where it takes you. Just a random suggestion. Position legs 4 feet apart. Right foot points forward as left foot is in at a 90 degree angle. Align right heel with left and stretch arms out to the sides and parallel to the mat. With legs straight and muscles engaged, shift hips back, reach right arm forward and place your right hand on your shin, ankle or around your big toe in yogi toe lock. Reach through both fingertips (energy moving in both directions), left hip slightly forward, lengthen the tailbone towards the back heel, pull up on right knee cap, twist the torso to open up the chest and heart. BREATHE. Beach or city this weekend? Me, thoroughly enjoying my homebrew. Whole Foods Market is one of my happy places and I go there at least once a day (sometimes just to walk through the aisles). Like I said, it’s a happy place. One of my favorite items to purchase is kombucha, a fermented tea rich in probiotics. The slight sour taste and carbonation satisfies my taste buds while the probiotic content keeps my gut healthy, improves digestion and immunity and helps with weight loss. YES, please! After discussing my healthy kombucha habit with a friend and the toll it was taking on my bank account, she suggested I make my own. So I took her advice and found numerous kombucha recipes online. I used one from poseymom with great results. 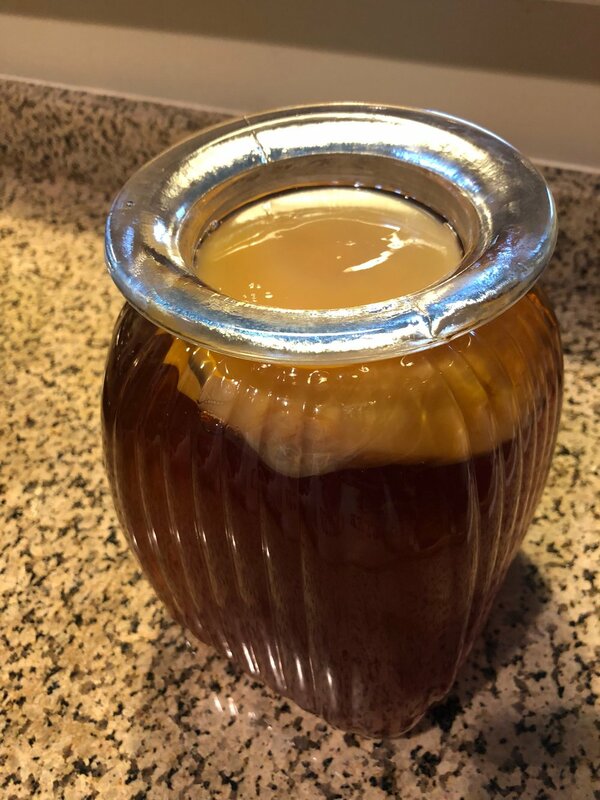 Making kombucha is easy, economical and fun to share with family, friends and co-workers. Go ahead and spread the kombucha love! Ingredients: Black organic tea, sugar, scoby, distilled water and vinegar (to start). The benefits of meditation have been scientifically tested. The goal is to bring balance and order to our lives by quieting the mind. Read more about how you can incorporate a meditation practice into your life. Strong Body. Peaceful Mind. Open Heart. Dance has always played a positive role in my life. As a child, I remember my mom grabbing me for an impromptu cha-cha-cha or salsa while cooking dinner for the family as music played in the background. In the evenings, my family gathered around the television with eyes glued to Solid Gold performers. My sister and I were mesmerized by the dancers' flashy outfits and fabulous dance moves which inspired us to choreograph our own dance routines immediately following each episode. I'm always searching for new and exciting ways to improve mental, physical and spiritual well-being and spontaneous dance is a great way to relieve stress, invite playfulness into your life and express yourself creatively. Ecstatic dance is defined as a style of free-form dance in which the music is the teacher. Organized ecstatic dance gatherings are popping up all over the country and provide a judgement-free and alcohol and drug-free environment for individuals to lose their inhibitions and dance to the beat of their own drum. This movement has sparked the interest of many including the New York Times. Whether it be at an ecstatic dance party or in the privacy of your own living room, invite music and free-form movement into your life and see if it's something worth adding to your self-care regimen. I turned 40 in May. I COULD NOT WAIT to jump out of bed the morning of and go for a run outside. I went for my longer 10-mile loop, tracking my time in hopes of confirming my youthful feeling with a strong pace. I was right! Being 40 offers a sense of freedom. Acceptance of who I am as a person. A celebration of my unique experiences that have brought me to this point. 40 spells rebirth. I'm proud of who I've become and excited to welcome opportunities that appeal to me rather than conforming to others' expectations. I'm excited to focus on health, wellness and self-care and continue along the path of personal and spiritual growth. I am stronger, more flexible, lighter and more confident than I was a year ago. Evidence that transformation is possible at any age. Embrace 40!